Popular stand-up comedian Kapil Sharma on Friday alleged that he was asked to pay Rs 5 lakh bribe to Mumbai's civic body, the Brihanmumbai Municipal Corporation, for his office, and tagged Prime Minister Narendra Modi in his tweets while asking if this was the 'achche din' he promised. Maharashtra Chief Minister Devendra Fadnavis was, however, quick to respond to Sharma’s angst and assured him that strict action would be taken against the culprit. 'I am paying 15 cr income tax from last five years and still I have to pay 5 lakh bribe to BMC office for making my office @narendramodi (sic),' Kapil tweeted on Friday morning while expressing his anguish and raising the issue of corruption. 'Yeh hain aapke achhe din? @narendramodi,' the comedian-actor sought to know in another tweet, referring to Modi's 2014 poll slogan of 'good days are ahead'. The post of Sharma, who has over 6.22 million followers on Twitter, was re-tweeted by many. The BMC released documents showing that Sharma's under-construction office building was considered 'illegal' and that a notice to this affect was issued to him in July, wherein he was asked to stop construction or face action. Taking cognisance of the complaint, Fadnavis requested the TV host to provide them with necessary information to punish the culprit. 'Kapilbhai pls provide all info. Have directed MC (municipal commissioner), BMC to take strictest action. We will not spare the culprit,' the CM said in a tweet. The BMC also asked Sharma to reveal the name of the officer who allegedly demanded the bribe. “I have requested Kapil Sharmaji to reveal the name of the officer who demanded bribe so that we can initiate inquiry and appropriate action against him or her. We hope that he will cooperate with us,” Manohar Pawar, chief engineer of vigilance department in the BMC said. “We are very sorry, if any of the officers caused inconvenience to Sharma, but we are hopeful that he will reveal the name of the offender,” Pawar said. However, the BMC later released some documents showing that Sharma's under-construction office building was considered 'illegal' and that a notice to this affect was issued to him in July. Through the notice, Sharma was asked to stop the construction and report to police. He was asked to produce proof within 24 hours that he had permission for the construction. The civic body warned that the 'illegal structure' would be removed if he didn't respond. Tiwari also asserted that this was the era of Prime Minister Narendra Modi and Maharashtra Chief Minister Fadnavis and anyone accused of asking for a bribe would have been caught and punished within 24 hours. “I also see a guilty conscience in his tweets because it could be possible that he paid a bribe and got his office made illegally,” added Tiwari. In another dig at Sharma, Tiwari said that the prime minister of this country paid his kitchen expenses himself and is working day and night to end the corruption while the people who provoked Sharma to tweet were the ones eating snacks worth one crore. “We have asked everyone to declare their entire income by September 30. It is quite possible that he was scared and that's why he started his social media rant,” added Tiwari. A senior Brihanmumbai Municipal Corporation official claimed that the actor had made some ‘illegal construction’ at his office in Versova area of suburban Mumbai and had been served a notice regarding the same, but he did not pay heed to it. “Kapil was then sent a notice by BMC on July 16 to stop or remove the construction, but he didn’t reply to it,” he said. The BMC also asked Kapil to reveal the name of the officer who allegedly demanded the bribe. Stung by corruption allegations, Shiv Sena, which rules the BMC along with the BJP, dared Kapil to name the bribe seeker. “This is not a comedy show where he can tweet what is going on in his life. He needs to immediately name the person publicly who asked for a bribe or people would watch the whole episode like a comedy drama, laugh over it and forget about it,” Sena spokesperson Manisha Kayande said. “Kapil Sharma is a very famous person and thus the moot question he needs to answer is that why would he give the bribe when somebody asked for it. Giving bribe makes him as much of a culprit as the one who asked for it,” Kayande added. ‘Let me assure you that if you desire to keep any disclosure made by you in this matter confidential, the same shall also be ensured,’ he said in a statement. Meanwhile, BJP MLA Ram Kadam filed a complaint with the cyber cell of Mumbai police alleging that Kapil, by keeping mum on the ‘bribe’ demand, did not ‘discharge his duty as a citizen’, and demanded a free and fair inquiry into the entire issue. Talking about the issue, Congress chief spokesman Randeep Singh Surjewala termed BMC led by BJP-Shiv Sena as ‘Bhrastachar Municipal Corporation’ and said, ‘The Acche Din show is houseful!’. 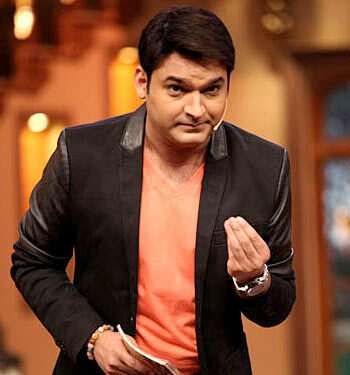 “Kapil Sharma is a popular host of a comedy show. The BJP-Shiv Sena show in BMC has been a tragedy,” he said in Delhi. “Everyone believed Modiji will deposit Rs 15 lakh in every account. Instead, it seems they will recover Rs 5 lakh from us,” he said. Sharma hosts the popular comedy chat programme The Kapil Sharma Show on television. He was the winner of The Great Indian Laughter Challenge in 2007 and later hosted the popular Comedy Nights with Kapil.